exam to simulate the actual FE exam. 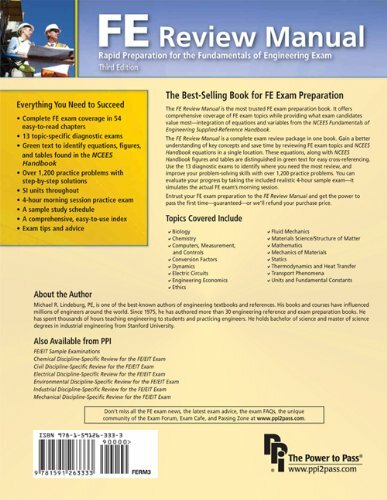 Everything You Need to Succeed on the FE Exam Thousands of practice problems, with step-by-step solutions Diagnostic exams help you to assess your strengths and weaknesses A practice exam with hundreds of multiple-choice questions SI units throughout, just like the exam Short chapters create manageable study blocks NCEES nomenclature and formulas Sample study schedule Exam tips and advice from recent examinees_____________________________ Since 1975 more than 2 million people preparing for their engineering, surveying, architecture, LEEDreg;, interior design, and landscape architecture exams have entrusted their exam prep to PPI. For more information, visit us at www.ppi2pass.com . subjects with 342 reinforcing practice problems and illustrations, tables, figures and formulas. EIT Review manual: "Rapid Preparation For The General Fundamentals of Engineering Exam: Current For The 1998-1999 Exam"(1998) outsells all other similar works combined and contains a money back guarantee. If readers do not pass the exam after using this cram course manual with 900 practice problems and a complete eight-hour practice exam, the publisher will refund their money. Lindeburg's other books include "Getting Started As A Consulting Engineer"(1994), "Fire And Explosion Protection Systems: A Design Professionals Introduction" (1995), and "1001 Solved Engineering Fundamentals Problems" (1997). Michael R. Lindenburg graduated from Stanford University with B.S and M.S. degrees in industrial engineering. As founder and president of the Professional Engineering Institute, he has taught and supervised hundreds of engineering review courses.